Performers include: Ricky Whittle, Ian McShane, Emily Browning, Pablo Schreiber, Yetide Badaki, Bruce Langley, Crispin Glover, Orlando Jones, Gillian Anderson, Kristin Chenoweth, Jonathan Tucker, Cloris Leachman, Peter Stormare, Chris Obi, Demore Barnes, Corbin Bernsen, and Mousa Kraish. 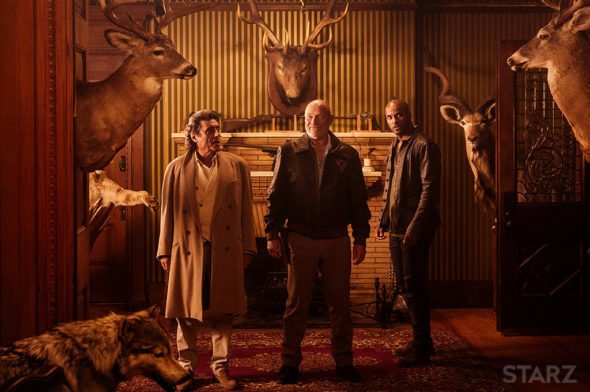 A fantasy drama based on the Neil Gaiman novel of the same name, the American Gods TV show centers Shadow Moon (Whittle), who accepts a job offer from the enigmatic conman known as Mr. Wednesday (McShane). After completing his prison sentence, Shadow Moon encounters Mr. Wednesday and a storm blows in — one that will completely change his life. Unmoored by the death of his wife, Laura (Browning), Shadow signs on as Mr. Wednesday’s bodyguard. Doing so escorts him into a strange reality he finds difficult to comprehend. In this secret world, gods and magic are real. The Old Gods are alarmed by the increasing potency of the New Gods — like Technical Boy (Langley). Mr. Wednesday is a cunning, if charming, old con man. In order to defend the existence of the Old Gods in the New World, he strikes out to form an alliance between them, so that they can defend themselves and restore some of their stature, significance, and sway. Will he be able to recruit the ancient goddess of love, Bilquis (Bakaki)? Her hunger for adoration and devotion is far from sated in the current day. A leprechaun whose luck has soured, Mad Sweeney (Schreiber) cannot understand how he lost his charisma, never mind his way. Still, it is fortunate he is always up for a brawl, since that comes with the territory when one is in Mr. Wednesday’s employ. Traversing the U.S. with Mr. Wednesday, Shadow wrestles with this new reality and his role in it. What do you think? Do you like the American Gods TV show? Do you think it should be cancelled or renewed for another season? I LOVE THIS SHOW!!! I just wished the new seasons didn’t take forever and a day to air! Love this show! Anything mystical, magical to take us away from reality!